Amy Gladman, 34, of The Crescent, Stapleford. Pleaded guilty to exceeding the alcohol drink-drive limit on Ilkeston Road, at Morley, Ilkeston. Must pay an £85 victim surcharge and £85 costs. Disqualified from holding or obtaining a driving licence for 26 months. Community order to last until January 14, 2020, with 150 hours of unpaid work. Kok Lam Woo, 42, of Chestnut Avenue, Belper. Pleaded guilty to speeding in Suffolk on the A12 dual carriageway. Fined £107 and must pay a £30 victim surcharge and £85 costs. Disqualified from holding or obtaining a driving licence for six months. Kyle Ride, 21, of Westmorland Way, Jacksdale. Pleaded guilty to using a vehicle without insurance. Fined £162 and must pay a £30 victim surcharge and £85 costs. Driving record endorsed with six points. Eleanor Rose Walke, 23, of Penryhn Road, Hunters Bar, Sheffield. Pleaded guilty under the Single Justice Procedure to speeding on the northbound carriageway of the M1 motorway, at Tibshelf. Fined £303 and must pay a £30 victim surcharge and £85 costs. Driving record endorsed with six points. Jack Wimhurst, 29, of College Street, Long Eaton. 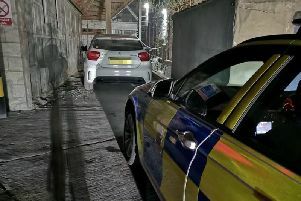 Pleaded guilty under the Single Justice Procedure to using a vehicle without insurance on Main Street, Elvaston, Derby. Fined £300 and must pay a £30 victim surcharge and £85 costs. Driving record endorsed with six points. Marta Izdebska-Grayson, 38, of Garden Crescent, South Normanton, Alfreton. Pleaded guilty under the Single Justice Procedure to five counts of speeding on Mansfield Road, at Alfreton. Fined £76 five times and must pay a £38 victim surcharge and £85 costs. Disqualified from holding or obtaining a driving licence for six months. Piers James Vincent-Thorpe, 20, of Beresford Lane, Woolley Moor, Alfreton. Pleaded guilty under the Single justice Procedure to speeding on the A619 Chesterfield Road, Staveley. Fined £66 and must pay a £30 victim surcharge and £85 costs. Disqualified from holding or obtaining a driving licence for six months. Luke David jones, 29, of Fletcher Street, Ripley. Pleaded guilty to failing to provide a specimen or specimens of breath when suspected of having driven a vehicle and in the course of an investigation into whether he had committed an offence. Must pay £85 costs and an £85 victim surcharge. Community order to last until January 20, 2020, with 100 hours of unpaid work. Disqualified from holding or obtaining a driving licence for 36 months. Jack Chambers, 31, of Westwick Street, Ilkeston. Pleaded guilty to exceeding the alcohol drink-drive limit on Westwick Street, at Ilkeston. Must pay a £115 victim surcharge. Disqualified from driving for 62 months. Pleaded guilty to driving while disqualified. Pleaded guilty to obstructing a police officer. Committed to prison for 16 weeks. Pleaded guilty to using a vehicle without insurance. No separate penalty. Thomas Mark Horne, 23, of Broughton Close, Riddings, Alfreton. Pleaded guilty to pursuing a course of conduct which amounted to stalking which amounted to harassment by making numerous unwanted phone calls and by sending emails and other messages by social media. Must pay £85 costs and an £85 victim surcharge. Community order to last until January 15, 2020, with a Rehabilitation Activity Requirement and 80 hours of unpaid work. Restraining order to last until January 15, 2021. Rebecca Margaret Hayter, 45, of no fixed abode. Admitted failing to comply with a community requirement of a suspended sentence order by failing to attend with the responsible officer. Suspended sentence of ten weeks of imprisonment suspended for 12 months which was imposed for the offences of assaulting a police officer in the execution of her duty at Critchley Street, Ilkeston, and for another assault in Ilkeston, is to be amended by extending the operational period to 13 months. Luke John Meads, 37, of no fixed abode. Admitted failing to comply with the supervision requirements imposed after release from imprisonment by failing to attend with the supervising officer. Pleaded guilty to stealing meat valued at £40 belonging to Aldi on Manor Road, at Ilkeston. Must pay £40 compensation. Pleaded guilty to stealing shampoo, conditioner and three Lynx gift sets belonging to Superdrug at One Stop, on Charlotte Street, Ilkeston. Must pay compensation. Pleaded guilty to stealing biscuits and flapjacks belonging to One Stop, on Charlotte Street, Ilkeston. Pleaded guilty to stealing four bottles of Persil liquid belonging to One Stop, on Charlotte Street, at Ilkeston. Pleaded guilty to stealing three bottles of Surf liquid belonging to One Stop, on Charlotte Street, at Ilkeston. Pleaded guilty to stealing shavers valued at £85 belonging to Superdrug, on Bath Street, Ilkeston. Must pay £85 compensation. Committed to prison for 19 weeks. Steven Hall, 46, of no fixed abode. Indicated a guilty plea to possessing 0.53grammes of class B drug 5F-MDMB-PINACA. Must pay a £20 victim surcharge. Discharged conditionally for six months. Daniel Marcus Ste Handley, 26, of Pinewood Avenue, Codnor, Ripley. Indicated a guilty plea to failing to comply with notification requirements under the Sexual Offences Act by moving from a home address and failing to register at a police station any other address within three days. Must pay a £115 victim surcharge. Pleaded guilty to failing to surrender to custody having been released on bail in criminal proceedings. Committed to prison for 26 weeks. Justin Michael Peters, 39, of Ley Lane, Mansfield Woodhouse. Indicated a guilty plea to possessing a quantity of cannabis, a class B controlled drug at Wellington Street, Long Eaton. Must pay an £85 victim surcharge and £85 costs. Pleaded guilty to assault by beating in Long Eaton. Community order to last until July 15, 2020, with a Rehabilitation Activity Requirement and 80 hours of unpaid work. Simon Coll, of St Mary’s Street, Ilkeston. Proved under the Single Justice Procedure that he threw, dropped or deposited a cigarette end in Bath Street, Ilkeston. Fined £220 and must pay a £30 victim surcharge and £127.50 costs. Alex May, 21, of Calderdale Drive, Long Eaton. Pleaded guilty to failing to comply with a requirement of a banning order under the Football Spectators Act of failing to surrender his passport. Fined £266 and must pay a £30 victim surcharge and £85 costs. Kinga Gracyzk, 20, of Cromford Road, Langley Mill. Indicated a guilty plea to failing to secure the transfer of waste to an authorised person with a written description of the waste so others could avoid a contravention of the Environmental Protection Act while being a person who imported, produced, carried, kept, treated or disposed of controlled waste. Must pay a £20 victim surcharge and £400 costs. Discharged conditionally for 12 months. Neil Leon Ratcliffe, 56, of Cherry Tree Avenue, Belper. Indicated a guilty plea to committing an act outraging public decency by filming or attempting to film up the skirt of a female in Derby. Indicated a guilty plea to committing an act outraging public decency by covertly filming women in skirts in Derby City Centre. Must pay an £85 victim surcharge and £85 costs. Community order to last until January 17, 2021, with a four week curfew with electronic monitoring and a Rehabilitation Activity Requirement. Tyrone Knighton, 22, of Beauville Drive, Ilkeston. Indicated a guilty plea to stealing Playstation 4 controllers valued at £100 belonging to Tesco, at Rutland Street, Ilkeston. Fined £120 and must pay £100 compensation and a £30 victim surcharge and £85 costs. Indicated a guilty plea to stealing Playstation 4 controllers valued at £300 belonging to Tesco. No separate penalty. Must pay £100 compensation. Indicated a guilty plea to failing to surrender at court having been released on bail in criminal proceedings. No separate penalty.